Time and time again we see a player boom a drive straight down the middle of the fairway only for them to hit their approach just a few yards, as they hit a truly awful fat golf shot. I believe we have all been there. Itâ€™s hard to forget that feeling as your body jars and you quickly check to see if you have hurt your hands or wrists – amidst the embarrassment of having played one of the worst shots in golf. Thereâ€™s no doubt, a fat shot instantly knocks your confidence, especially when the divot flies further than your golf ball! Typically players will rack their brain for answers and question every part of their swing in an effort to work out why they hit it fat and how to stop it. They question how in one minute can they drive with perfect swing tempo, nailing the ball into position A on the course and then next derail with a horrendous shot where they strike the ground before the ball. It can certainly cause a fair amount of panic as they frantically search for a cure to help them stop hitting any further fat shots in the future. Fortunately there is a way to fix this ghastly swing fault and it starts with understanding exactly what a fat shot is and what precisely causes it. This instructional article will aid you with the specific reasons as to why you are hitting the ball fat and then run you through several drills and fixes to help you eliminate it from your game. So letâ€™s move on to defining what a fat golf shot is. What Is A Fat Shot? A fat shot occurs when you hit behind the golf ball. The club head impacts the ground before the ball resulting in a poor shot covering hardly any of the intended distance. As well as being called a fat shot, you will also hear it called a duffed shot, or a sclaffed shot. When a player hits a fat shot around the green you will also hear the expression â€œchunkedâ€. Quite simply instead of cutting into the grass after the ball, a divot is created before the ball when the club head cuts in to the ground an inch or so behind the ball. The next section analyses what causes a fat golf shot to occur. What Causes A Fat Golf Shot? It is important to understand the causes and reasons as to why you may be hitting fat shots before you start to work on the fundamentals to correct this golf swing fault. If you have an inconsistent swing it isnâ€™t good practice to simply compensate for your problems with quick fixes. It is much better to discover the underlying problems and work on rectifying them. Below you find the 5 reasons why golfers hit fat golf shots. A steep over the top swing causes a fat shot. This is a common fault because it typically occurs for golfers that slice the ball. A steep swing results in an angle of approach that is far too sharp. If this sounds like you, you are most likely tilting your shoulders instead of turning them. It is far better to have a golf swing that turns around the body and not an awkward steep up and down movement. You should work to ensure you have a shallower plane where the shoulders are level. All too often golfers with a steep swing drop their right shoulder on the downswing and inadvertently catch the ground in front of the ball. Generally a low handicapper will hit a fat shot by swinging too shallow into the ball, rather than being too steep. A shallow plane is usually evident in someone who hooks the ball. Often the club comes in too close to the ground and unfortunately catches it before the ball. The shallow fat shot is rarer than a steep fat shot. The key to any good golf swing is the transference of weight from your right side to your left side. If you move your weight over to your right on your upswing, but leave it there on your downswing you are likely to hit a fat shot. It is critical on your downswing to move your weight over to the left side. All too often a fat shot is caused by a player leaving their weight on their right side because they have tilted to the left rather than made a deliberate transfer of weight from right to the left side. With too much weight on the right side, a golfer can drop their right shoulder and curve their body like a bow. In this position itâ€™s difficult to make the necessary lateral shift and far too easy to hit it fat. Check your posture because a fat shot can be caused by having the ball too far forward at address. This is also true if you are standing too close to the ball. Such a setup creates a situation whereby the lowest point of the swing is behind the ball, thus making you prone to hit a fat shot. Picture the situation, youâ€™re standing on the fairway and you convince yourself itâ€™s better to hit a club hard rather than taking it a little bit easier with a longer club. Effectively you are pressing too hard for distance with your chosen club and in such situation it is far too easy to end up lunging at the ball because you arenâ€™t totally comfortable. In an effort to hit the ball hard you make too sharp a transition at the top of your swing and descend with a steep strike too far behind the ball. Fortunately whilst you may be susceptible to hitting fat shots due to some of the above reasons, there is hope in the form of the 5 ways to cure your fat shots set out below. The following 5 cures will help you fix the things that are currently making you hit the ball fat. In the process you will learn the importance of swinging on the right plane and how to shift your weight correctly. Fixing your tendency to hit the ball fat literally comes down to getting the fundamentals right. To begin with you need to maintain your posture and minimise any sway as described in the first cure below. Make sure you check your posture and setup. By keeping your chin up and your head away from your chest you will make it a lot easier to swing through. It is important to keep your posture without lowering your head. Check that you are leaning forward, around 20 degrees from your hips. A low posture leads to fat shots. Donâ€™t dip your body. Check you arenâ€™t bending your left arm due to a low posture. When you take the club away check you donâ€™t hit the ground a few inches behind the ball. If you are too low you will more than likely hit it fat unless you straighten up. The grip isnâ€™t usually a factor in these situations; though remember to follow the principles in this article titled â€œHow to Grip a Golf Club Correctlyâ€. Ensure you are balanced without your weight going forward onto the ball of your foot. Keep balanced by having it between the heel of each foot and the ball with a slight favoring towards your heel. I recommend you read this article titled â€œProper Golf Stance Setup Tipsâ€. Learn to shift your weight properly on your downswing from right to left. On your upswing your weight will move to your right side and on your downswing you should transfer it to your left side. Remember 80% of your weight should be on the front foot at impact. If you are swinging on a steep plane you should flatten your shoulder turn to encourage a shallower plane. In doing so try to swing more around your body. For the shallow swing you should push the club away on the upswing, so as it doesnâ€™t come inside so much. This way when you turn through the bottom of the swing will move forward, thus ensuring you strike the ball at the right point on your swing arc. Finally a classic tip we have all heard before but very pertinent for this situation, namely keep your eye on the ball – donâ€™t go looking after the ball flying down the fairway, before you have even hit it. By making a deliberate point to keep your eye on the front of the ball you will improve your hand eye coordination. Having discussed ways to cure a fat shot, it is now appropriate to list 4 drills and fixes for you to work with on the practice range. Having determined what is causing you to hit fat shots, the next step is to practice drills that will improve your golf swing. Whilst you will almost certainly apply conscious thought to any swing correction made during practice, the end result should be no more fat shots when you swing unconsciously on the course. You will play your best golf when you rely on muscle memory out on the golf course, due to the fixes becoming a natural part of your golf swing. Through dedicated practice you can definitely make the necessary fixes to your swing. This drill allows you to determine how fat you are hitting the golf ball. Place a tee two inches away from the golf ball, but lined up with the spot you want to make impact, namely the front of the ball. This way you can look down having played the shot and see exactly where you made a divot. Ideally the divot will start where you placed the tee, if itâ€™s in front then you have hit a fat shot. Divots should always be created on the target side of the ball. If you are on the range you will probably prefer to use a coin instead of a tee, but place the coin directly behind the ball with just enough space from the ball to strike it without hitting the coin. This works well because on the range it is difficult to tell to what extent you are hitting fat shots. If you donâ€™t move the coin you know you have hit the ball before the ground. To aid your weight transference itâ€™s good to learn how to push through the ball. You can train yourself to do this by moving the ball so as it is adjacent to the left toe. Learn to stay down as you transfer your weight from right to left. In doing so learn to focus on stretching out towards the ball, ensuring you fully transfer your weight to your left side. As mentioned above you should work to ensure you have a shallower plane where the shoulders are kept level. This can be done by crossing your arms across your chest, taking a stance without a club and then turning as if to make a golf swing but keeping the shoulders level. As you practice this technique make sure the left shoulder is kept up and doesnâ€™t dip down. This is a great fix for golfers hitting fat shots due to having a steep swing plane. A steep plane will be someone tilting their shoulders rather than turning them. Simply practice your golf swing on a hill lie so as the ball is above your feet, as this encourages you to play with a flatter swing. I must say this is the best instructions I’ve ever had since starting 40 years ago trying to play Golf. Thanks immensely for these instructions. After playing some consistent and decent golf during the first half of my society’s season I have now lost my rythm and started to fat the ball. I have never done this before as my wayward shot is usually a push/slice and I have noticed that I tend to rock my shoulders rather than turn them. I am hoping the tips on here help me eradicate the dreaded fat. Thanks for a very clear and well articulated information, as usual. But why not use videos, like your u.s. colleagues? far more vivid and self explanatory. I purchased your new 4 magic moves and always regretted it was not in dvd format. I hope you surprise us with video instructions soon. Andy’s Reply: Many thanks for your comment. I will send you an private email but just to let you know the New Four Magic Moves is sold with an inclusive DVD (even viewable via our trial offer) you can download. I’m sorry you have missed it, like I say I will point you in the right direction via email. Just this week I developed the dreaded fat shot with my fairway irons. With you tips and exercises I realise my shoulder turn was wrong – the dips causing me to go in too steeply……thanks, onto the practice ground to get myself back in line. Many thanks for the detail. I have been suffering with this problem for longer than I care to remember! I am sure your information will really help, and will let you know how I get on. I just wanna say thank you for this great tip on hitting “fat”. I sometimes hit the ball fat and always wondered why and how can i fixed this. I always play with my father and he has the tendancy to hit it fat. Now i can show him (and myself) what his faults are and steps to rectify it. You always give good advise and i appreciate it. I enjoyed reading. I will use the drills because all drills help to improve my game. I do not take a divot and because of this I often hit a very low shot sometimes just skimmimg the grass. I would like a drill for correcting this problem. I got a new set of Callaway irons in February. After the first day of hitting them on the range I began to have tenderness on the inside of my right elbow. (i am right handed) . I used an arm strap to ease discomfort and even took 2 months off but still have Golfers Elbow with pain mostly with my driver. Do you have any suggestions on swing changes to ease this issue. I tend to have a long backswing and seems impossible for me to shorten it. 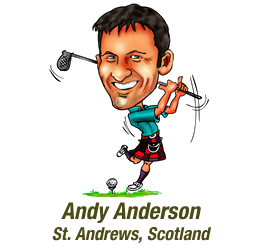 Thanks Andy I will work on that as my backswing is most likely too steep.